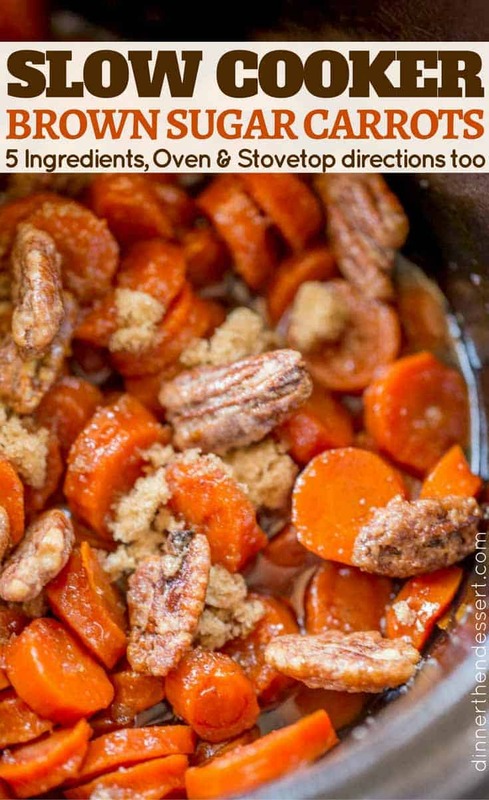 Slow Cooker Brown Sugar Carrots are an easy (and inexpensive) side dish for your holiday meals! Much lower in calories than sweet potatoes with a similar awesome flavor! 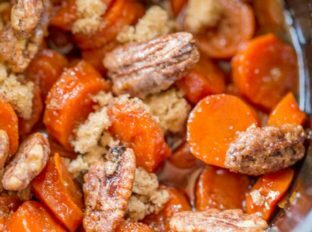 Slow Cooker Brown Sugar Carrots utilize one of my favorite low carb hacks, carrots instead of potatoes. 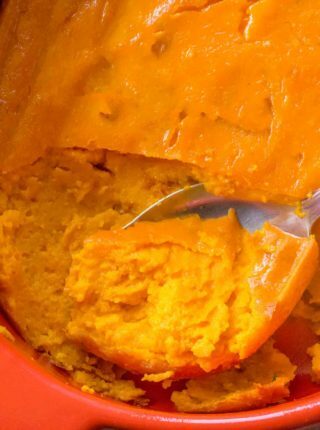 Yes we are adding butter and sugar here so this is not a dieters dream, but the fact remains, the carrots will have the same buttery, amazing, tender and creamy flavors of your favorite roasted sweet potatoes. Also, with just four ingredients you’ll love this side dish. Did I mention the cost? With a 5 pound bag of organic carrots costing $4.00 here I have a side dish that can serve 10-12 people for less than 5$. And it looks beautiful. I did gussy it up with some of my Slow Cooker Candied Cinnamon Pecans but you don’t have to if you don’t want to. This dish is a winner! In a slow cooker you can slice them as thick as you’d like. I kept them small for the kids to enjoy too, but have left them thicker and larger when I wanted to mimic sweet potatoes more. 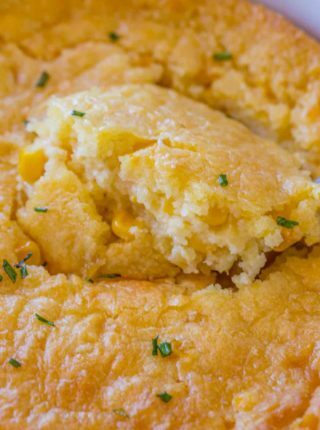 You can even cook these on the side of another side dish. Place inside a sheet of foil folded up and you can cook these next to Brussels Sprouts, knocking out two side dishes at once! Utilize the “keep warm” function 20 minutes shy of the cook time if you need to keep them warm a while. It’ll help prevent overcooking. In the slow cooker: Cook on low for 4 hours. 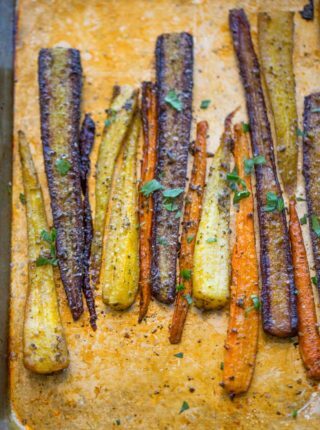 In the oven: Toss with all the ingredients in a foil lined pan. Cook at 375 degrees for 25-30 minutes. 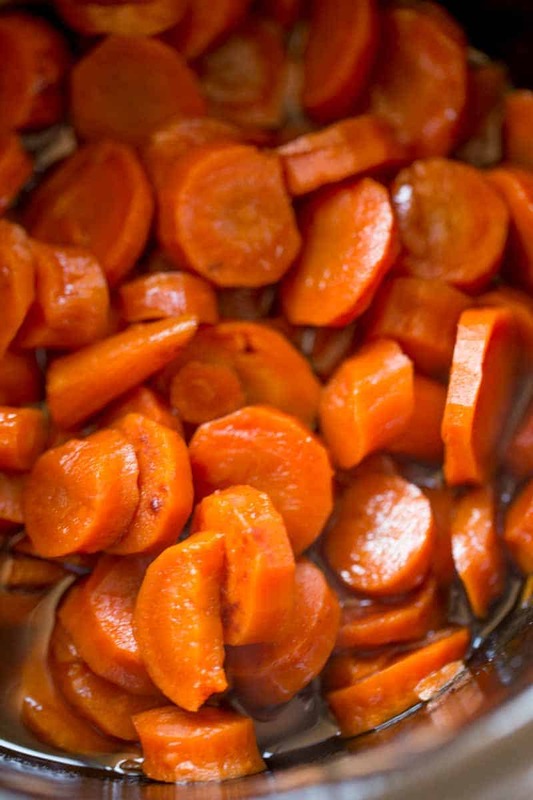 On the stovetop: Boil the carrots for 5-7 minutes. Then add to the pan with the same ingredients. Cook until glazed and thickened. 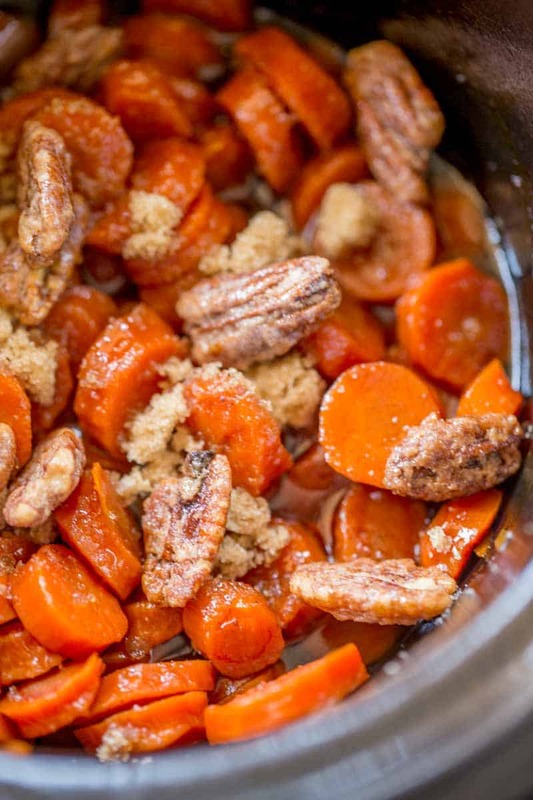 Garnish with additional brown sugar or Slow Cooker Candied Cinnamon Pecans. It seems to be a glitch, so sorry. It should be in the slow cooker for 4 hours. I’ll try and figure out how to fix it because it doesn’t seem like the edit is sticking. For diabetics you can use SPLENDA BROWN SUGAR. It comes out wonderful. Thanks for the tip, Mary Jo! Was thinking the carrots would be salted from the can…guess I will just make them and taste towards the end….thank you. I have several cans of sliced carrots…needing a quick side dish for a funeral dinner…wondering if I drained them and placed is saucepot and added remaining items except the salt, if they would turn out ok? About how long should they cook? Yes! And since cooked you’d only really need to cook down the glaze. I’d add least a tiny bit of salt though, seasoning is important. I use canned carrots all the time. Add bit of butter and SPLENDA BROWN SUGAR. Delicious. Tried making these and it was my first time ever making carrrots. I take issue with the lack of directions for the oven method. You didn’t mention that I needed to boil them first before placing in the oven. I cooked them as directed and they were hard and inedible. I’ll have to steam them or something to be able to eat them. I’m so sorry you had an issue with the oven method. Just to clarify, you don’t need to boil them at all before placing them in the oven. As long as they are cut into smaller slices and spread out on a baking sheet, they should come out completely tender after the recommended bake time. 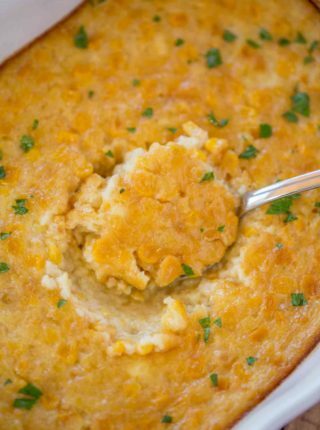 This is a perfect side dish for Thanksgiving! So delicious! Those look soooo good, I’ve got to try them! What a perfect side dish! I’d love this with my favorite Pot Roast! This would be perfect for pot roast! These carrots look so flavorful! My family will love these! I think they will be a new addition to my Thanksgiving menu! Love this idea to cut a few calories during the holidays! These sound so good! I am going to give them a try. I like carrots but I don’t like them crunchy. I’d love to hear what you think after trying! Sounds like this would be perfect for you.